On A Day Like This . . . I can move mountains! Today it dawned cool! I walked in the garden with my coffee, I turned off the A/C and opened all the doors and windows to get all the stuffiness out AND I re-organized our pantry. Sounds easy? LOL. It is easy when you move every couple years, or every six months. You get rid of a lot of stuff. Once you settle, you really have to watch out, STUFF begins to accumulate. Like for some reason, I ran out of mustard once, and then every time I was grocery shopping for a while I would buy another mustard so I would be sure not to run out, and now I have like 11 mustards, no two the same, German mustards, Chinese mustards, French mustards, no, no, I won’t be running out any time soon. AdventureMan had made a list for me at the commissary yesterday, including Penne for a Pasta Putanesca he was making to celebrate my return, he’s not so hot on anchovies, but he did a bang-up job on one of my all-time favorite pastas ever. As I cleaned out today, I found two more boxes of penne. We changed over to a tankless water system last week, it just seems like a good idea. When we bought the house, one thing made me nervous, the hot water tank was in the pantry, right in the middle of the house. Hot water heaters fail, they all do, eventually, and when it goes, it can leak all over everywhere. The first time it happened to me, we were out of town and it took a week to get all the carpeting and walls dried out. So I traded worrying about a leaking hot water tank for worrying about a gas explosion, aarrgh. Actually, it’s pretty safe. We used tankless systems all the years we lived in Germany, and I really liked them. It feels right, just heating the water when you use it, not holding it – and heating it – when you are not. So now the big water tank is gone, and I brought in new shelving, and put that together, it was almost idiot-proof, almost . . .
That took most of the day, putting the new shelving in, clearing the shelves, sorting out the items, labeling the shelves so AdventureMan can find what he needs, although to me, it all SEEMS very logical, signs saying “Condiments” “Oriental Condiments” “Back-up Baking Supplies” “Tomato things” “Soups” and “Canned Sea Food”, etc. I did not label the pasta and rice; they just seemed so obvious. All this with doors and windows open and the most heavenly breeze blowing through; give me the right climate and I can move a mountain! I got the laundry all done as I was re-organizing the pantry, I even cleaned out one of the spice drawers (getting rid of spices kept from Kuwait and Qatar because I couldn’t bear to part with them, but four years . . .) it’s time, and they aren’t really good any more. And at the end of the day, there is even time to sit outside in the bright, cool, breezy sunlight sipping a glass of tea and watching all the birds come in for one last bite before bed time. Today, the church prays for the Diocese of the Central Gulf Coast. That’s us. Today, we need your prayers. 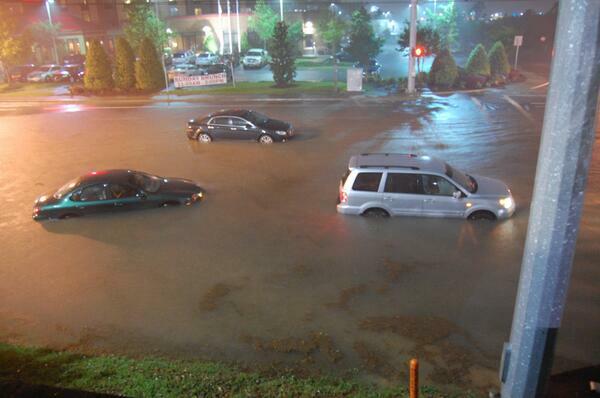 I don’t think I have ever seen a storm like we saw last night. This was not a hurricane type storm, this was a thunderstorm that had Pensacola grey and dark and gloomy all day Tuesday, and then around 7 pm, all hell broke loose. Thunder. Lots of thunder. Not just a tornado watch, but a tornado warning for our area, one of those “get away from all the outside walls of your house to a protected inner area NOW” kind of warning. The tornado warning passed. The tornado watch passed. We found a leaking door frame, and brought buckets. The thunder and lightning continued. We found a leaking ceiling light fixture, and put another bucket under it. The thunder and lightning and high wind continued. We found water coming down through a bathroom vent – thank God we have a lot of buckets. The thunder and lightning continued. We found a leaking closed door frame in another part of the house – four mixing bowls, surrounded by towels. The thunder and lightning continued. The thunder and lightning continued all through the night. We slept fitfully, AdventureMan getting up three or four times to check the buckets. I know, it sounds like we live in a terrible house, but we have never had things leak like this before. I think it has to do with rain blowing up under the roof vent, that’s all I can think of. AdventureMan has already called the roofer, and the insurance office, who is not answering, due to the number of callers they are dealing with. Our son and his wife, down the street, have no electricity, and will come here later for some coffee and to charge their electrical devices. A road near us has collapsed, and in the collapse, contaminated two wells, so we are on a “boil water” notice until further notifications. Today, indeed, is a very good day to pray for the Central Gulf Coast. Most schools are closed, many offices are closed. 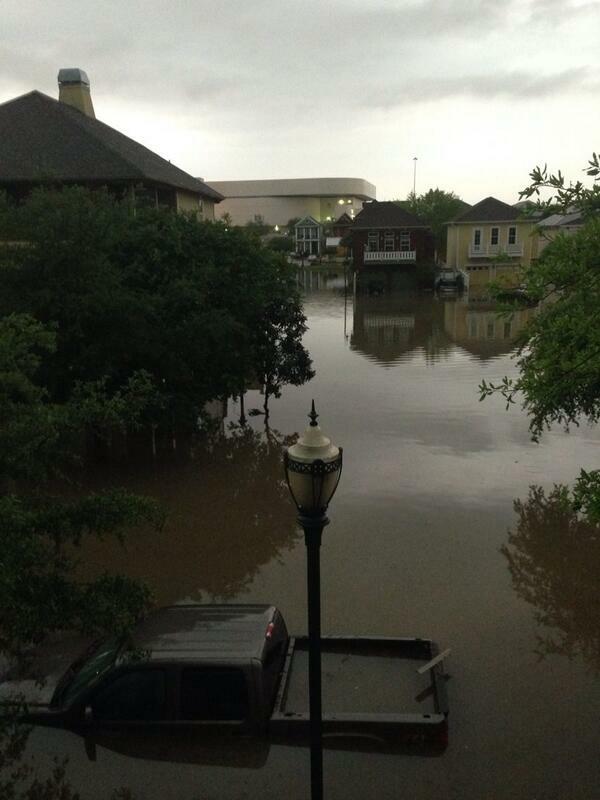 We sit high, but many are struggling with high water and flooded roads. Many have worse leaks than we have. Many are lacking power, and how can you boil the water without power? 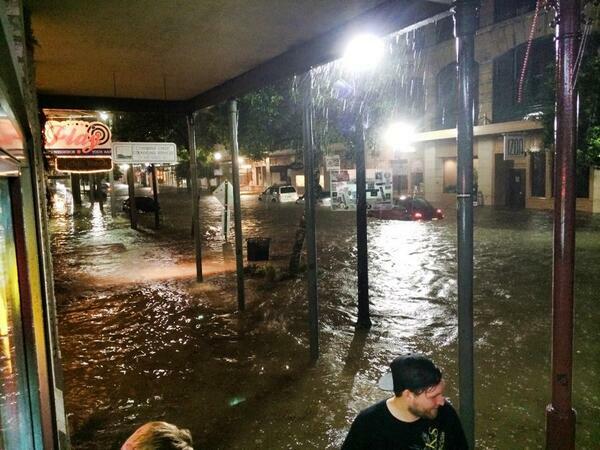 This storm dumped inches and inches of rain on us, so much rain that they don’t have an exact calculation yet. Our front yard is eroding in front of our eyes. And we are the lucky ones. Move 30 times? Check. Manage finances? Check. Buy or sell a house? Check. Buy a car? Check. It’s not that hard. You figure it out, you do it. Every now and then you have a crisis that’s outside your comfort zone. This week we ran into one of those. We’ve had a microwave, a wonderful huge microwave, with a platter that runs back and forth, instead of a circular revolving plate. About a year ago, it started stopping in mid-cook and the display would show “F9”, not a big deal, with a little jiggling, a little work around, we could get it working again and it worked most of the time. We bit the bullet. 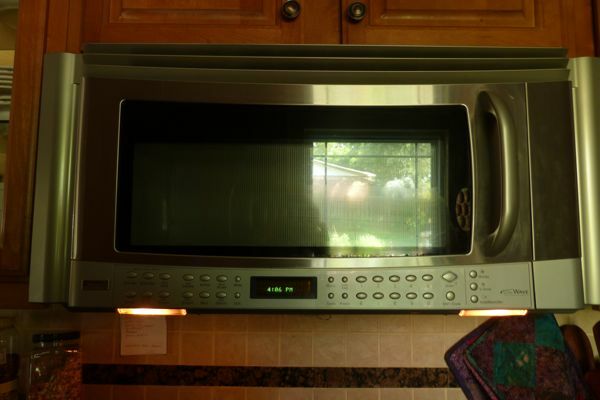 OK, just time to get a new microwave, go somewhere where we can buy it and have it installed, because installing is outside of what we can do well. We get to the store and discover that 36″ microwaves are very special. So special that the only one carried runs in the over $1000 range. We go to another store, same story. Evidently 36″ was to go over a 36″ range, which we have, but is no longer so trendy. Oh aarrgh. We decide to go home and do some online research, only to learn that the 36″ version for over $1000 has very poor ratings and the same problem that we currently have, made by the same manufacturer. Double aarrgh, and double aarrgh again because while AdventureMan and I are good problem solvers, we are out of our pay grade when it comes to kitchen design and installation, but we know enough to know that it has to look right. When we bought our house, we bought it from a man who has a lot of fun redesigning and remodeling and updating houses. The kitchen is small, but beautifully high end. Fortunately, he is local and I have his number so I called him and asked for his design input. He gave me several good ideas, and even better, we had a great, wonderful chat and I was able to tell him how much we enjoy the little touches he put in the house to make it special. By the time I finished, I had a plan, and it dovetails with some other work we have scheduled, to have a tankless water system put in. Years ago, a friend gave me a book mark I still have, a quote from Bishop Sheen that says “All worry is atheism, because it is a want of trust in God” and while I believe that is true, and have greatly banished worry from my daily life, every now I find myself that squirrel running on that wheel of anxiety, knowing I am worrying for nothing, but unable, in my own strength, to get off the wheel. Thanks be to God, in his mercy, for leading me off that fruitless path! They didn’t even answer the phone. When I called Customer Service to tell them that of the 12 drinking glasses they had sent me, 11 arrived perfectly, one arrived in smithereens, smashed, crushed. I can’t imagine how 11 could be flawless and one could be so badly damaged. They told me to leave a message, so I did. As I was holding the paperwork in my hand, I was able to give them my order number and what had happened. I told them I didn’t want to return the glasses I received – I totally love them – but would they send me a replacement for the one that arrived in smithereens? They didn’t call me back. I barely noticed, I was having a busy day, only around six did I think of it and had second thoughts about dealing with them again. Then early yesterday morning I found their e-mail, sent shortly after I had called, telling me they had no replacements, but they would credit my account for the entire amount and I could give them to charity or use them as I wished. I was blown away. Who does that? No, no, they are not glamorous, but they are perfect for everyday use. 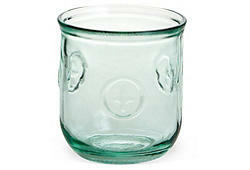 They are made of recycled glass, they have wide bottoms and they have little raised fleur-de-lis on them. Why is this important? I have a cousin; when he was a boy he would talk enthusiastically and knock over his drinking glass. It got to be a family joke. But you can prevent these things. If you have children and want them to learn how to dine with adults, you choose items that will help them succeed – wide bottom glasses, for example, that are not easily tipped over, with details on the outside that will help little hands grasp the slippery outsides without slipping. It’s not that hard, you just have to give it a little thought. 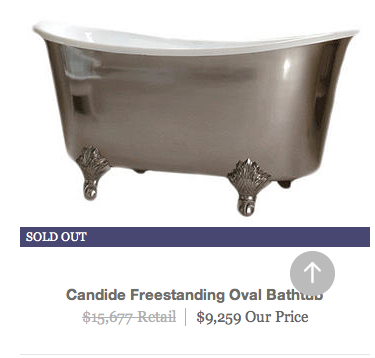 One King’s Lane is also where I found the fabulous bathtub I showed you. I still yearn for this tub! 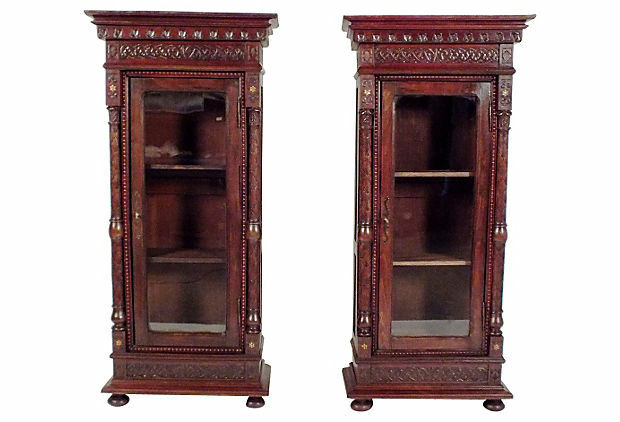 And today, oh my sweet heaven, I found a pair of bookshelves I can barely restrain myself from ordering. They are beautiful, and unlike anything I would find in Pensacola, and oh! They hold books! This article resonates with me because when we moved to Tunis, the garbage collectors would fight over our trash. I felt horrible, we had an infant, and there were diapers in the trash. 😦 Our maid would take cans and jars and especially jars with lids out of the trash, and ask if she could take them. We learned before throwing anything away to see if she wanted it first. They used, and re-used, everything. We learned to look at our consumption in a whole new way. It was one of the best things about living in an ‘alien’ community; we learned to see ourselves with different eyes. Thank you, Hayfa, for this fascinating article. 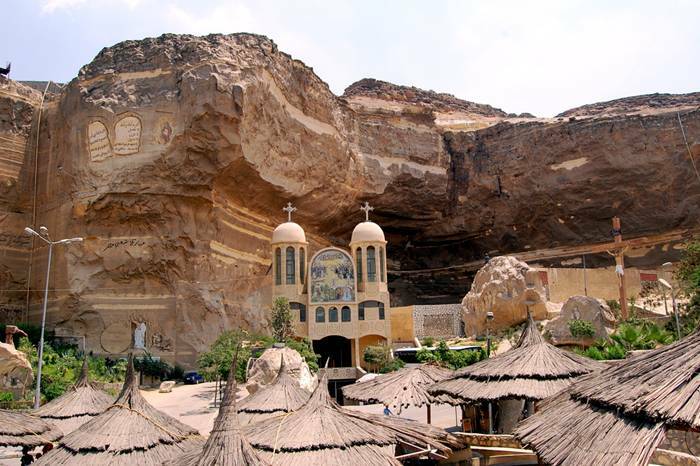 The Monastery of Saint Simon, also known as the Cave Church, is located in the Mokattam mountain in southeastern Cairo, Egypt, in an area that is known as ‘garbage city’ because of the large population of garbage collectors or Zabbaleen that live there. The Zabbaleen are descendants of farmers who started migrating from Upper Egypt to Cairo in the 1940s. Fleeing poor harvests and poverty they came to the city looking for work and set-up makeshift settlements around the city. Initially, they stuck to their tradition of raising pigs, goats, chickens and other animals, but eventually found collecting and sorting of waste produced by the city residents more profitable. The Zabbaleen would sort through household garbage, salvaging and selling things of value, while the organic waste provided an excellent source of food for their animals. 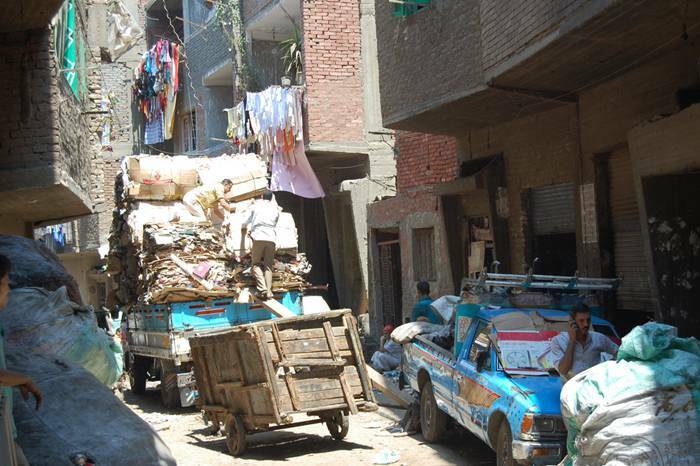 In fact, this arrangement worked so well, that successive waves of migrants came from Upper Egypt to live and work in the newly founded garbage villages of Cairo. For years, the makeshift settlements of the Zabbaleen were moved around the city trying to avoid the municipal authorities. 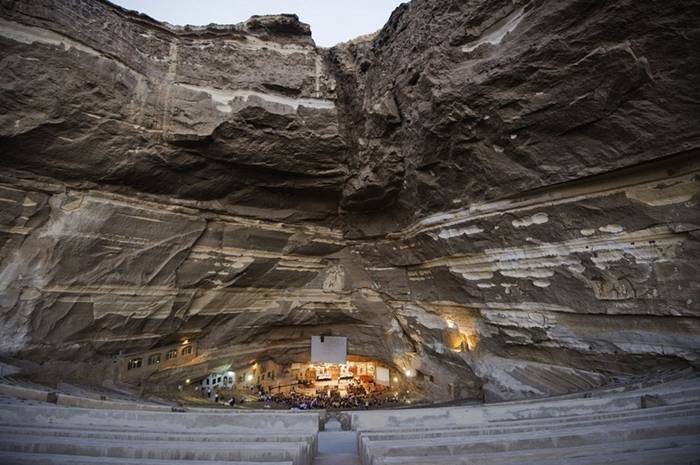 Finally, a large group of Zabbaleen settled under the cliffs of the Mokattam or Moquattam quarries at the eastern edge of the city, which has now grown from a population of 8,000 in the early 1980s, into the largest garbage collector community in Cairo, with approximately 30,000 Zabbaleen inhabitants. 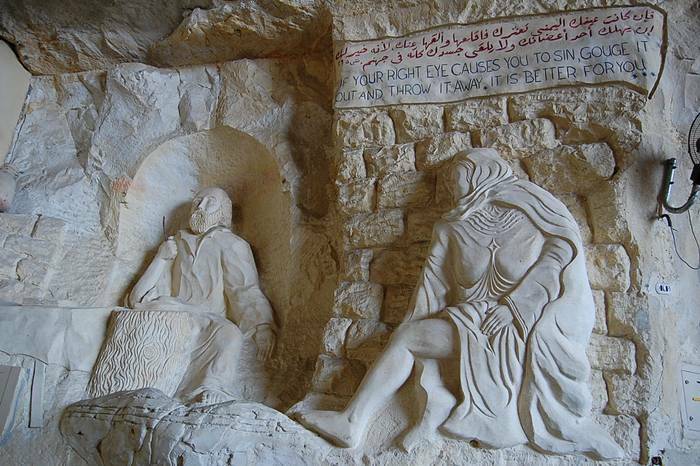 Egypt is a Muslim-majority country, but the Zabbaleen are Coptic Christians, at least, 90 percent of them are. 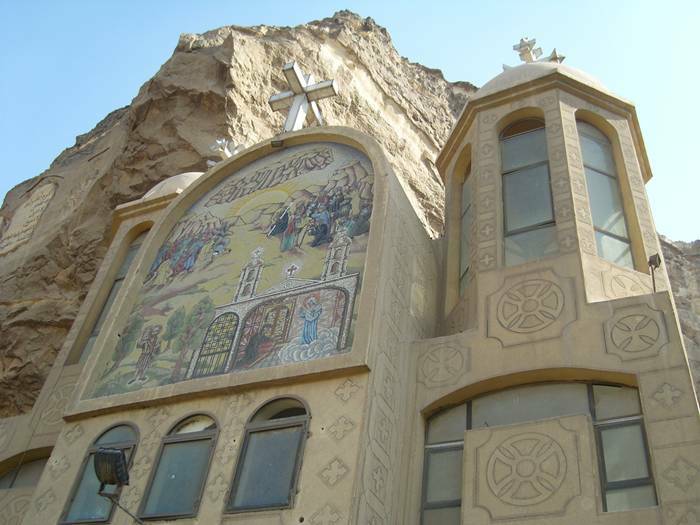 Christian communities are rare to find in Egypt, so the Zabbaleen prefer to stay in Mokattam within their own religious community even though many of them could afford houses elsewhere. 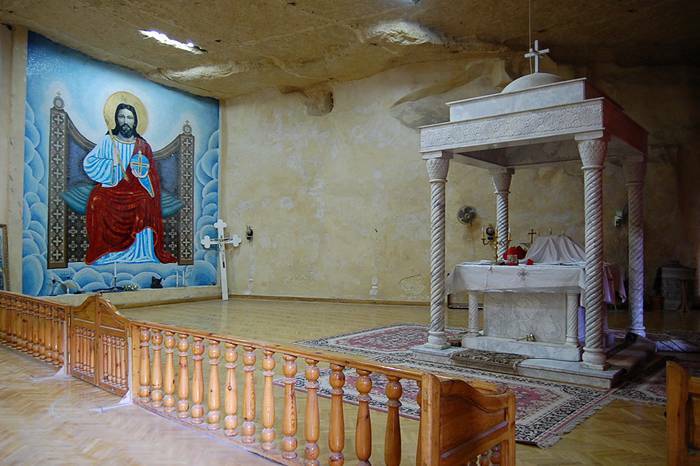 The local Coptic Church in Mokattam Village was established in 1975. 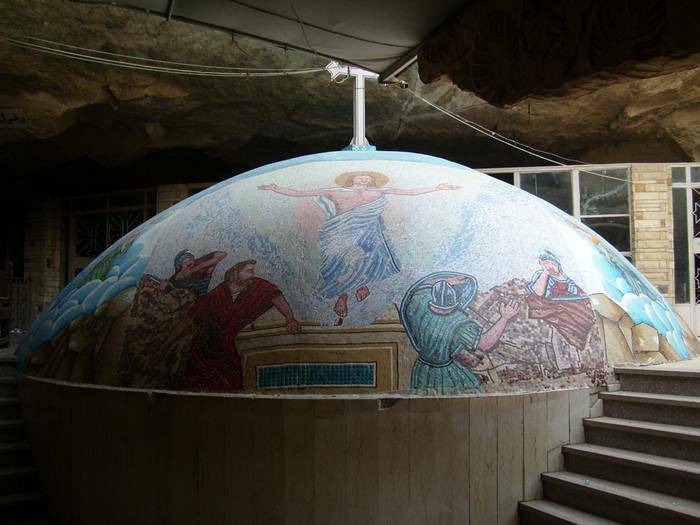 After the establishment of the church, the Zabbaleen felt more secure in their location and only then began to use more permanent building materials, such as stone and bricks, for their homes. 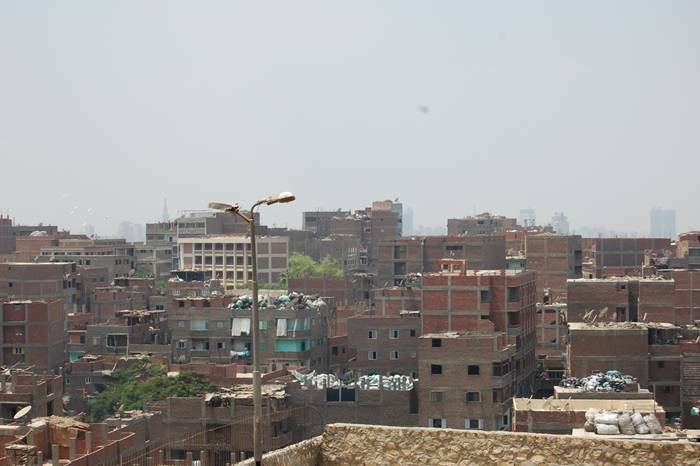 Given their previous experience of eviction from Giza in 1970, the Zabbaleen had lived in temporary tin huts up till that point. 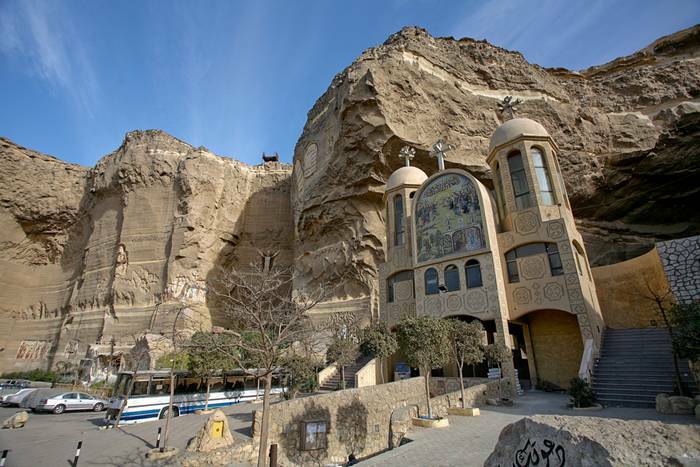 In 1976, a large fire broke out in Manshiyat Nasir, which led to the beginning of the construction of the first church below the Mokattam mountain on a site of 1,000 square meters. 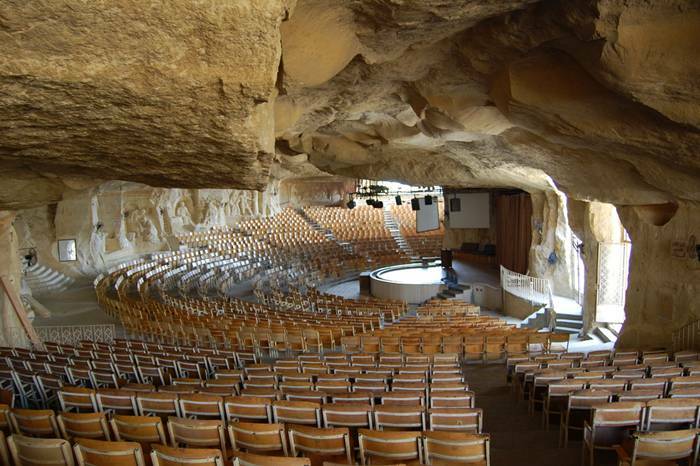 Several more churches have been built into the caves found in Mokattam, of which the Monastery of St. Simon the Tanner is the largest with a seating capacity of 20,000. 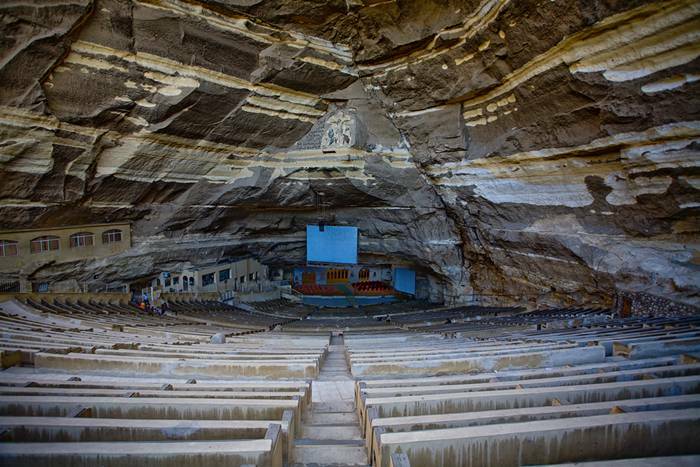 In fact, the Cave Church of St. Simon in Mokattam is the largest church in the Middle East. “She can do that without consulting?” our son asked. Moving furniture is one of those things I do. I get tired of everything the same-old same-old. If I’m not moving, it gives me a chance to re-think things, and try something else to see if that works better. We have a dining room we hardly ever use. We have never eaten a meal in there. We had too much furniture, and besides, in the family room we have a huge circular teak table that seats eight. It’s less formal and a lot more fun. The dining room is in a very quiet part of the house, so we talked about turning it into a library (see! we talked!) and that is what I did. But when you move a piece of furniture, or get rid of another, or both, you end up also having to evaluate all the things inside that piece of furniture, and having to think through where things need to go. Life is so different. As an Army wife, we entertained all the time. I hit the sales in Czechoslovakia and have bar ware and wine glasses for our 48 closest friends, and we just don’t entertain like that any more. We don’t even drink like that! We do entertain; we host the monthly book club some months, I have my quilting group in frequently, and we have dinners for family and dinners for visiting IVLP delegates. We entertain people we like. It’s a whole different world when it’s a choice. I’m getting rid of a lot of pieces I’ll never use again and I’ll never miss once they’re gone. I’m getting rid a lot of irrelevant things, including an old TV cabinet, you remember them? They enclosed an old fashioned TV, had shelves for videos (remember them?) and little drawers for CDs? I’ve been using it as storage for art work and a thing that plays music from an iPod or two. I’ll hang some of the art work, get rid of some, and find another place for the MP3 player. Yesterday was the big work, the figuring out how to change furniture and carpets into new positions. Of course, once you move something, you have to clean the places no one ever sees, so it takes more time, but you’ve got to do it right. Today was the small but time-consuming work of getting things put away in a kind of order so that they can be found again. 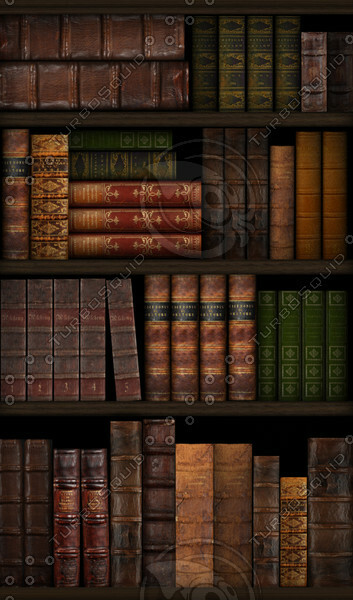 When I put books on the shelves three years ago, it was like fiction here and non-fiction there, and I never went back. Now, I have them sorted into subjects and country, art related, or religious. Got rid of about half my CD’s but still have too many. It’s a messy process; you take something fixed, turn it into chaos and slowly, slowly, bring a new pattern into being. Tomorrow I need to hang some more art work. It’s been three years. Then we live with the changes and see if they work for us. If not . . . the process starts over, but in the meanwhile, got rid of some stuff! One of these days, need to tackle the closets . . . Have an entire closed full of evening clothes I never wear, and can’t bear to part with . . . yet. That one really did hurt, but I’m not much for groaning and writhing in pain, so I didn’t. Today was a confluence of events. 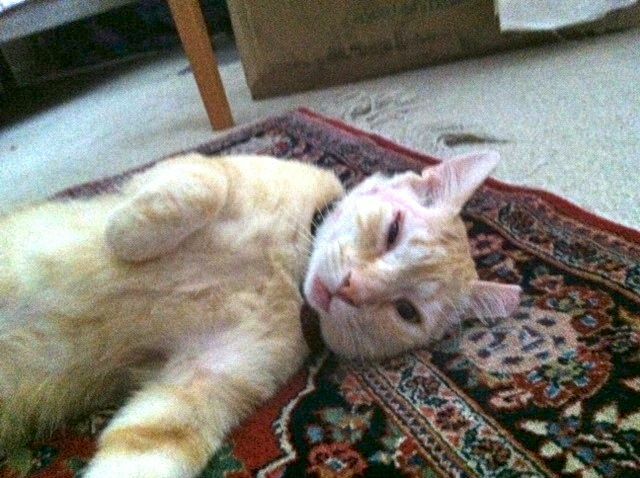 Yesterday, when the air conditioning people were at our house, all day, configuring and installing the new air conditioning system, the terrified and disoriented Qatari Cat spent the day in the large laundry room, with his cat bed and his food and water, and his litter box. It was a long day, and he was alone, and he could hear loud bumps and thuds, and he could smell strange smells, and hear strange voices. 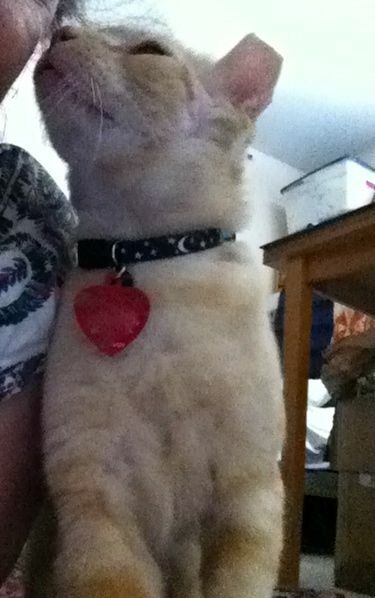 Therefore, when let out, he needed to snuggle, closely, to the one he thinks is his mother, i.e. me. 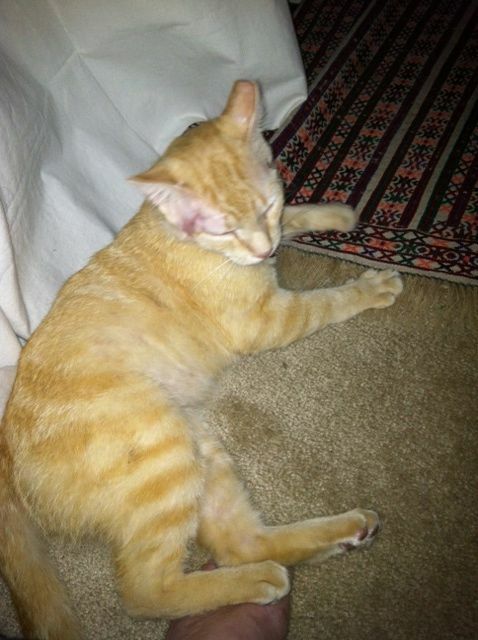 He curled into my arm and purred and cried about his long day and how scared he had been. He was still snuggling, closer and closer, during the night, as I was trying to sleep. He is a good sleeper, doesn’t move around a lot, but when he is snuggled up against me, it is hard to move. Now and then he will snore, or go into kitty-dream state, legs thrumming along and sub-vocal snarling, which can wake me. Our normal water aerobics instructor was out, and the substitute was wonderful, but we did more repetitions of high kicks, jacks-crunches, and more high kicks; it was a great workout, different from what we are used to. We really needed to clean our floors after the air conditioning crew, so AdventureMan took all the carpets outside for a good vacuum front and back while I tackled the tile floors throughout the main level of the house. Some of the grime was ground in, this wasn’t one of those quick swish washes but a lot of stoop and scrape, or hands and knees and scrub kind of jobs. While down close, I also noticed the base boards needed a swab, more bending and stooping. I still had one appointment to go before I could kick back, and while waiting, I noticed my back was a little uncomfortable. By a little uncomfortable, I mean it had my attention, I couldn’t get comfortable. By the time I got home, it had my undivided attention. 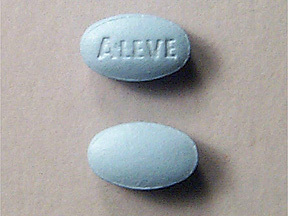 I know what works for me, back when I had a reaction to a root canal, I discovered Aleve, so I had some on hand. When I went to take one, I saw this great big capsule. 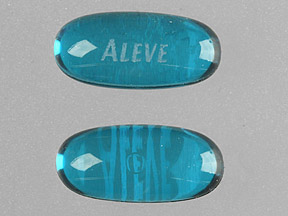 I remembered tiny little blue tablets, sort of ovoid, but I guess I had just grabbed whatever I saw and it happened to be a capsule. Swallowed the capsule. There is a reason I don’t like taking medicines, and that reason is that because I don’t take a lot of medications, when I do, I can tell. It takes the edge off. I feel slow. I feel a little loopy. I feel tired. And then, by the grace of God, in an hour or so, I feel no pain in my back. It wasn’t a bad day, just a day with some unexpected conditions. Scrubbing floors is not my favorite thing. In Kuwait and in Doha I had wonderful women who kept my floors sand-free, and sparkling clean. As I clean my floors, I found myself remembering them fondly. AdventureMan popped his head in the door to tell me how much he likes vacuuming the carpets outdoors, where he can see the intricacies of the patterns. He can see I am grumpy. “I don’t really like cleaning floors!” I grump. A quick call and the A/c people are on the way to check it out. “Do you know how old this A/C is?” he asked. Yep. It’s twenty years old. And now it has a leak in the coils. It could be fixed; we’ve been having it fixed from time to time already, and maybe it could limp along a little while longer, but this little Alaska girl can’t take that chance; it is getting HOT in Pensacola. New air conditioners, I learned, are more efficient, even the cheapest will save on our electricity bill, which, in the three hottest months of the summer, can soar by three hundred dollars and change. They run more quietly. With more efficiency, they can save more. They are also chillingly expensive. Since we have another unit running upstairs, he schedules our replacement for Tuesday, AFTER the three day weekend, and oh, did I mention, it has gotten hot? Wednesday and Thursday hit the 90’s (F) and the downstairs is more than a little stuffy, even with all the ceiling fans whirling madly. But late last night I heard our upstair unit cycle off . . . and stay off for a good long while. This morning, there is an almost-cool breeze, a freshness in the air, and what a blessing, that in the middle of what might be a long hot weekend, to have some winds from the north blowing through, blowing away the humid heat that blows up from the Gulf. I lay awake, thinking that for us, it is only a wait until Tuesday, because, by the grace of God, we have an emergency fund to cover events like this. I think of the trio of homeless men we passed on Palafox on our way to a meeting, cheerily greeting us, but sleeping out in the heat and humidity, with mosquitos biting. I am sure I am not the only one this morning thankful for the blessings of the NNW winds.